It was fifty years ago today- October 2, 1968 the first game of the World Series- the American League Champions the Detroit Tigers at the National League Champion St.Louis Cardinals at Busch Stadium. The Cardinals were the defending World Series Champions having won the 1967 Series over the Boston Red Sox in seven games. Game 1 would be the two most dominating pitchers in baseball facing each other- Bob Gibson for the Cardinals who had a record 1:12 ERA in 1968 a record that still stands 50 years later- against Denny McLain who won 31 games for the Tigers that season- the only pitcher since Dizzy Dean in 1934 to win 30 or more games. The day belonged to Bob Gibson who would set another record that still stands on this afternoon [all World Series games would be played in the daytime until 1971} when he broke Sandy Koufax record of most strikeouts in a World Series game with 17. The anticipated pitchers duel didn’t materialize as the Cardinals scored three runs off of McLain in the 4th when McLain walked Roger Maris to lead off the inning, with one out McLain walked Tim McCarver. Mike Shannon singled to left scoring Maris- both McCarver and Shannon moved to second and third base on an error by Tigers left fielder Willie Horton. Julian Javier then with one out singled to right scoring both McCarver and Shannon giving Gibson all he would need. McLain was out of the game after pitching just five innings. 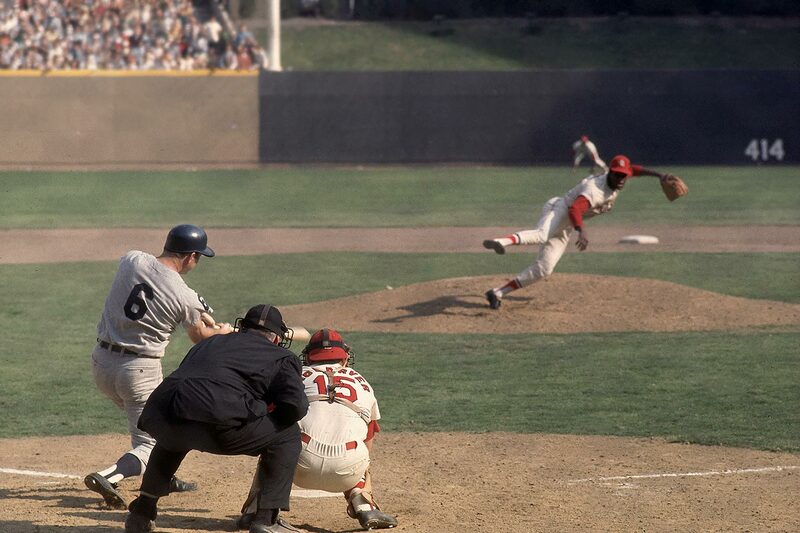 The Cardinals would add one more run on a Lou Brock home run in the 7th- and the rest was all Bob Gibson who pitched a complete game shutout – giving up 5 hits and a walk to go along with seventeen strike outs. Game 2 is set for October 3- Mickey Lolich will be going for the Tigers against the Cardinals Nellie Briles.